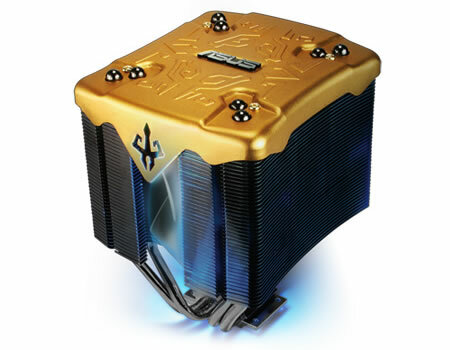 In celebrating a milestone of High-end CPU coolers, Asus announced the new release of 3,200 sets of limited-edition Triton 79 AMAzing CPU coolers to commemorate its popularity among global gaming enthusiasts. The Asus Triton 79 AMAzing is able to support Intel Core 2 Extreme / Core 2 Quad Quad-Core CPUs (LGA775) and AMD Athlon 64 FX/X2 Dual-Core processors (939/940/AM2/AM2+/1207+). The Asus Triton 79 AMAzing is ideal for gamers who wish to overclock their systems and retain the choice to use multiple computing platforms. The name AMAzing represents the high level of achievement of this flagship cooler in terms of high performance, stylish outlook and gorgeous packaging. Made just for this deluxe limited-edition package, every component is well protected by Polyurethane foam plastic; and each owner of the ASUS Triton 79 AMAzing will have an ultra-exclusive identification card marked with a limited-edition serial number. There is no doubt that the Triton 79 AMAzing is the superior choice for computer gamers who require ultimate performance, absolute silence and eye-catching designs.